During Lynn’s talk, she referred to herself as “the queen of Sperry Tents,” and it’s true, they pop up over and again in her design plans. Of course, my ears immediately perked up, because I’m a Sperry connoisseur, as well! :) I asked her to share her best tips from years of working with these beauties, and she graciously obliged. Here they are, along with photos from a few of Easton’s Sperry events! What do you love most about using Sperry tents in your design plans? Our favorite thing about Sperry Tents is that they assimilate into the great outdoors so beautifully. Their artisan construction, delicate profile, and organic elements allow them to blend beautifully and seamlessly into the great outdoors. The combination of the translucent sailcloth with hand-hewn wood poles, the lyrical lines of the tent, and the flags tossing in the wind creates a welcoming and whimsical backdrop for our design aesthetic. Photos by Eric Kelley. See more from this wedding in Southern Weddings V9! Why do you choose a Sperry over other types of tents for your clients? We love the way a Sperry looks at night when you light the top of the tent. The ceiling of a Sperry tent will glow making them as beautiful from the outside as the inside. We also love how they look from a distance. Their natural beauty stirs anticipation as guests make their way to enter the tent! Do you have any money-saving or design-maximizing tips to share when working with a Sperry tent? Unlike a frame or structure tent, Sperry tents are beautiful without a stitch of “clothing” – a.k.a. draping! We do tend to drape the side poles to add a bit of luxury, but it is not necessary. The natural amber wood poles of a Sperry are beautiful on their own, and we use them as a design element of the wedding décor. What are a few little-known tips or tricks from your experience working with dozens of tented events? — It is very important to consider your historical temps when selecting your tent! When the temperatures rise, the coolest tents will be a white vinyl pole or a white vinyl frame tent as the solid vinyl does the best job of blocking the heat from the sun. 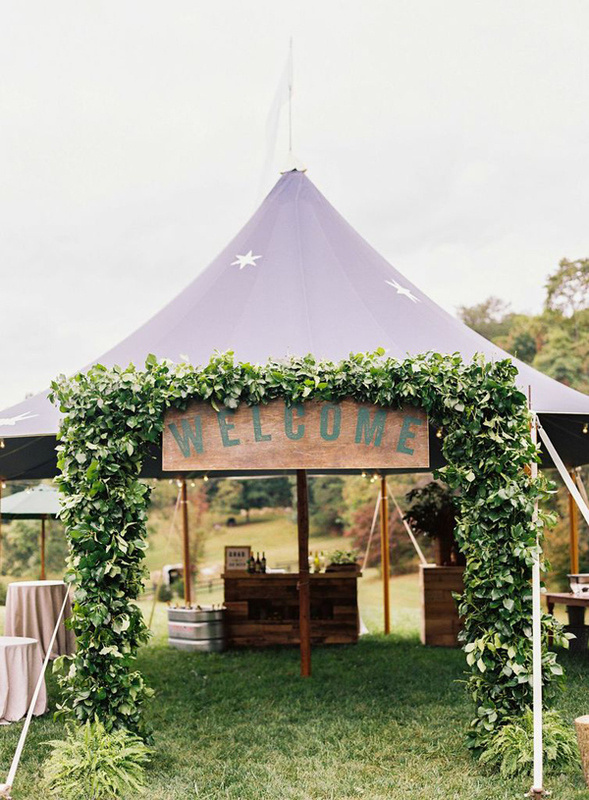 — Sperry tents, while beautiful, are light porous, so you will need to be mindful of how your florals will handle the heat during set up if it’s a very warm day. — It is also important to remember that a clear top tent acts like a greenhouse, so we never use them during the warm months without AC. — Ask your tent vendor if they have 10′ poles available for your selected tent. Lifting the side pole height tends to cost a bit more but the extra lift on the sidewalls is worth it! — If you are working with Sperry tents, remember they come in all shapes and sizes! If you need back of house tents for catering, the band, or restroom facilities, utilizing matching Sperry tents may be more visually appealing. They also make fantastic rain back-up plan tents for ceremonies or cocktail, because they require little to no décor to be aesthetically pleasing. What is the number one thing readers should know about throwing a tented event? Tented events are expensive! You have to remember you are essentially building a room that needs to have lighting, power, and some temperature control, and that gets expensive. If you need to floor the tent, do not be surprised when the cost of the flooring is typically more expensive than the entire tent itself. Like many of you, I wanted a space I could customize to my liking on my wedding day. We opted to rent a Sperry Tent for our reception, and it was the perfect (beautiful!) blank canvas! Seating guests under a tent, as we did, is an obvious wedding choice, but tents can be the perfect backdrop to almost every part of your wedding day. We’re sharing ideas for some of those lesser-known tent moments today, inspired by our friends at Sperry Tents! Let’s start at the beginning: the ceremony! Tenting your ceremony site is a wise idea in the South, given our sweltering temps and strong sun. And of course, if it happens to rain on your big day like it did for Jess and Aaron (above), you’re already covered! As the ceremony concludes, a Sperry Tent is the perfect way to visually mark the cocktail hour as a distinct event! Ushering guests into a new environment will keep them engaged and offer an opportunity for fun decor, like the garland and sign above. If you decide against tenting your entire cocktail or reception space, tenting just a portion of it can still make a huge impact! Guests will love venturing into a smaller tent to order a drink at the bar, kick off their heels on comfy sofas, or pose in front of a photo booth. Of course, we still love the idea of tenting your entire reception space — and we know your guests will, too. Whether you add flooring, a dance floor, custom lighting, or heaters, everyone will feel right at home in the space you’ve carefully crafted. Our last tenting opportunity falls at the end of the evening! Make like our Volume 7 couple Callie and Jamie and erect a tent just for your late-night dance party. Their guests transitioned into a Sperry Tent for dancing and late-night snacks after dining al fresco, and from the photos, it looks like that decision really helped end their celebration with a bang. Whenever you choose to employ a tent on your wedding day, we absolutely hope you choose a Sperry Tent to do it. The quality of a Sperry from sawmill to event site is second to none, and the end result is simply beautiful – handhewn wooden pools, snappy sailcloth, pretty corner patches, and merry pennant flags waving in the breeze above it all. All of Sperry’s design decisions prioritize craftsmanship and have a gorgeous, classic aesthetic that’s at home anywhere from a field to a beach to a manicured backyard. You simply can’t go wrong! For more information on Sperry Tents and to find a specialist near you, head to their website! For weddings and events in Virginia, North and South Carolina, and Georgia, contact Sperry Tents Southeast directly. This post is brought to you by Sperry Tents–thanks for your support of the brands that make Southern Weddings possible!